As the term draws to a close at a frightening pace, we have had the opportunity to experience some incredible events over the past week. Thursday evening involved 160+ year 11 students being bused into the city for the Year 11 formal. After several hours of dancing and music, which caused the venue to shake, we handed the now tired and happy students back to parents and started to plan the 2018 event. Friday night saw the annual Prefect’s Quiz Night, which raises funds for the Prefect Project. This year the project is based at the Dingwall Trust in Papatoetoe, helping to renovate and redecorate a house used to house young people in need of protection and a caring and supportive family-style environment.This year’s Disney theme was very successful, resulting in a thoroughly enjoyable evening, where prefects, staff and families came together in a way unique to Kristin and showed their support. Saturday evening saw the inaugural Open Air Cinema, organised by the KFF. Nicky Shave and her army of helpers did an amazing job in both organising the event and also ensuring that it ran smoothly on the evening. The weather also smiled on us, resulting on over 400 people attending and ensuring that this is an event we may see again in the near future. Please enjoy the Easter break, have some ‘down time’, put the books away for a while and use the time to relax and recharge for next term. If you are travelling during the holidays, use the opportunity to try new challenges and come back ready to share these experiences with your friends. Have a great holiday. On 25 April Kristin will be represented at a number of Anzac Day Services around the region and we encourage you to attend one of the services that are listed below. We ask that students who attend any of these events do so in their winter uniform and make themselves known to any staff in attendance. Details of all services in Auckland are available here. Parade assembly 9.15am on ​Sanders Ave. Parade starts 9.25am. Service commences 9.30am. Service - 6am. Form up for parade at 5.30am. Meet at the entrance to the Auckland Museum Underground Carpark. The New Zealand Opera performed to Year 7 and 8 on Tuesday. It was very entertaining performance showcasing their humour, voices and talent. Even though it was only a cast of five that included the musician they captured everyone’s attention, especially when the whole audience was farm animals, but all of 8LNE can definitely say that their favourite part was when their totally willing teacher (not) performed as the celebrant for the wedding of a grumpy rich farmer who was soon to learn that he had been tricked by the sly vet, son and the son’s secret lover. 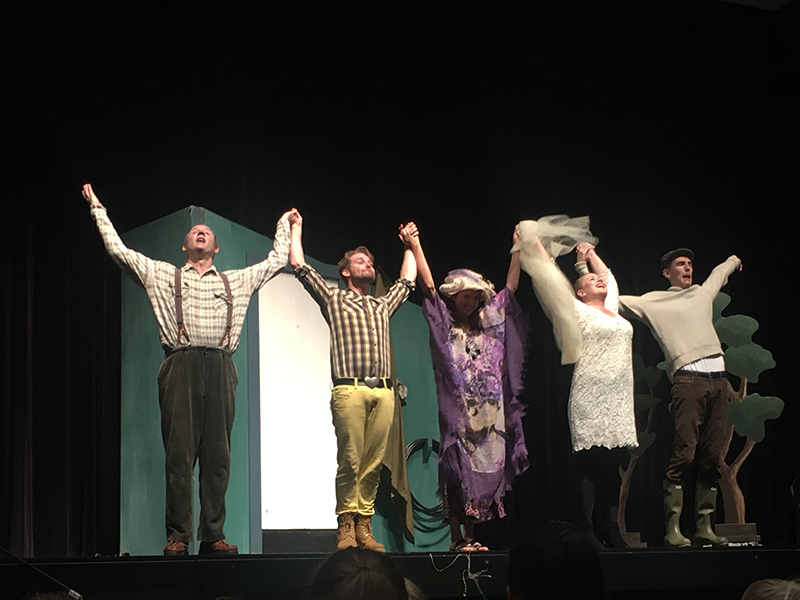 It was an awesome experience of singing and acting, and we all left with a smile on our face and a greater insight about opera. 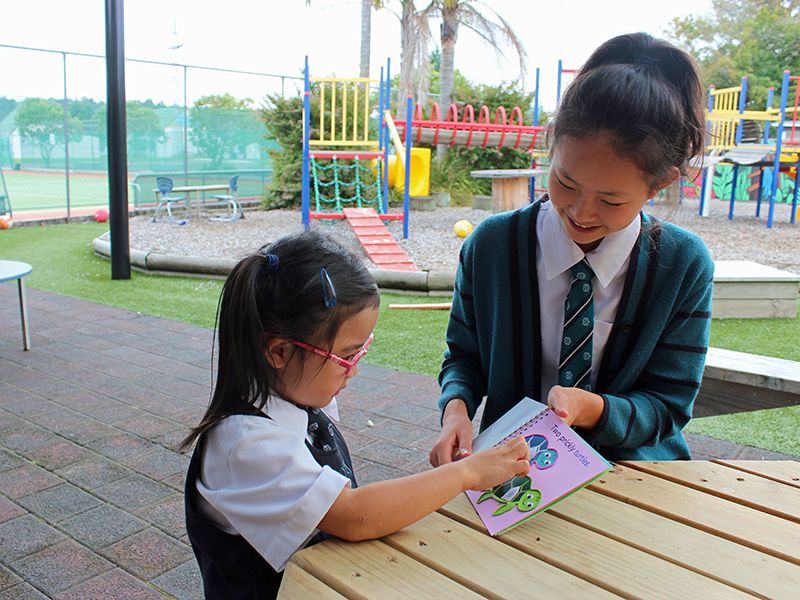 The Year 10 Community Project work of Christina Min (now in Year 11) was featured in a Fairfax News story this week. Christina will travel to the International Future Problem Solving competition in Wisconsin in June to present on this project. Christina's children's book, Who's Beneath the Sea, incorporates textures to help the reader feel the story. Velcro was attached to a "prickly turtle" and beads illustrated "bumpy dolphins". Some of the books were created with the assistance of the Kristin Family and Friends workshops. 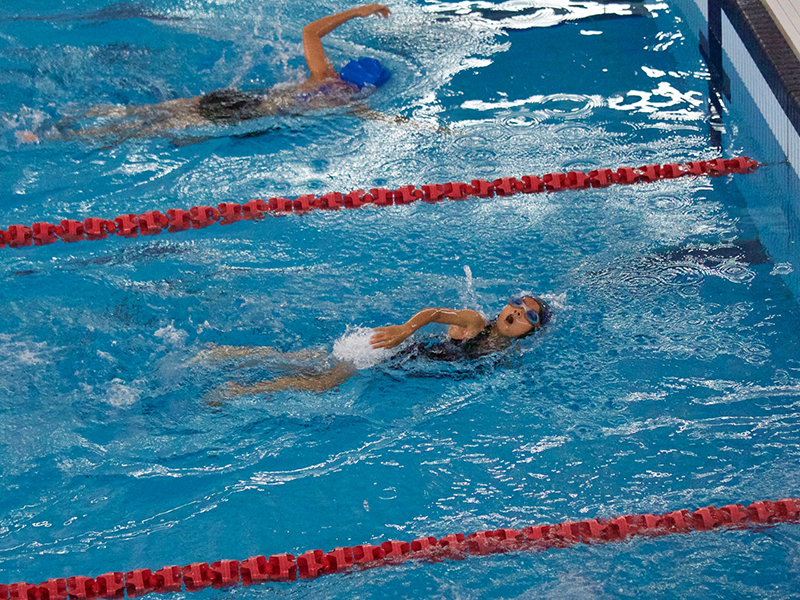 All members of our 15-strong Junior School Swimming team to attend the North Shore Swimming Competition last week at the Sir Owen G. Glenn National Aquatic Centre achieved a top-10 placing or better, from a field of 23 schools. Congratulations Jenny Zhang, Eloise Raper, Cooper Clague and Sadie McGavin who achieved a first place in one or more of their races. All students showed determination and focus in their individual races, while combining with flair and spirit to achieve two 1st places, one 2nd, two 3rds and a 4th in the Freestyle and Medley relays. All of our relay teams placed in the top 4! A huge thanks to Chia-I Liu, Vicki Clague, Lindsey Price, Harutaka Ariga and Antonia Chen for your support and hard work over the whole day. 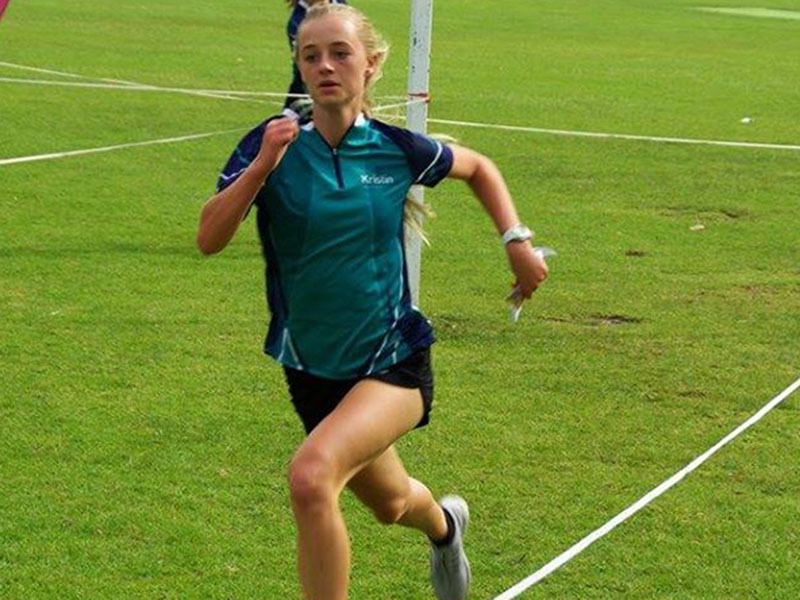 Congratulations to the following students who qualified for the AKSS Sprint Finals held on Saturday 1 April, following several weeks of qualifying – Georgina Dibble, Megan Bruce, Tegan Knightbridge, Henry Elworthy, Pippa Plummer, Paige Bell, Angus Syminton, Nate Leavy. Well done to the following students who finished in the top ten: Georgina Dibble – 2nd (Senior Girls), Tegan Knightbridge – 7th (Senior Girls), Megan Bruce – 10th (Senior Girls). Pippa Plummer missed out by one place, finishing 11th in the largest field of Y7/8 runners. The Junior School welcomed 500 visitors last Friday for another very successful Grandparents' Day. 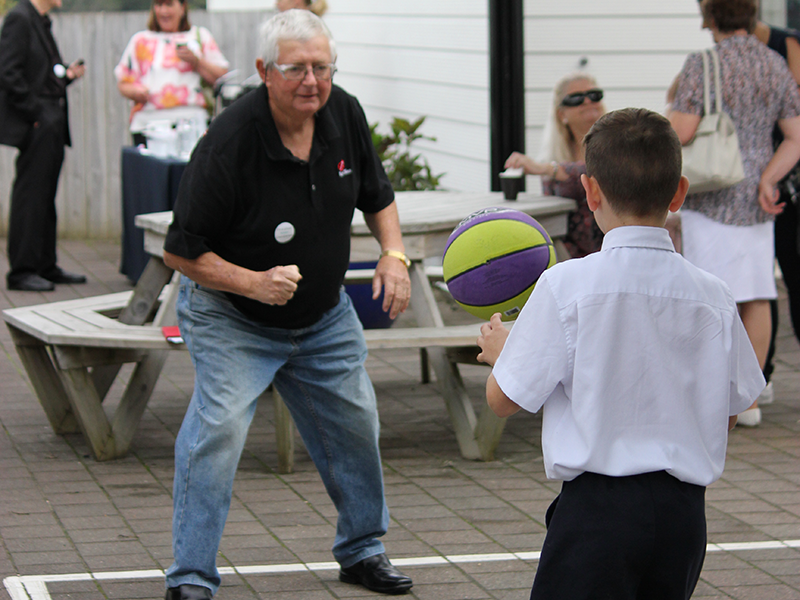 There was a competitive edge as proud grandparents had fun playing games outdoors, and also spent time in classrooms alongside their grandchildren. Many were beamed into the school via online devices, enabling grandparents to participate from all around the world. Many grandparents were impressed by the abilities students showed when engaging with the technology. Our collective thanks and appreciation are extended to Kristin Family and Friends and the band of parent helpers who were kept busy assisting grandparents to find their way around the school and who made sure there were plenty of refreshments available for everyone. The grandparents were treated to a spectacular special assembly and a showcase of the junior school talents. The talent of our choirs and instrumental prowess of individual and ensemble performers delighted the audience, both here and online – with more than 200 viewers logged into the live stream. The video recording of the assembly is now available in the Video Download section of the Kristin website. Grandparents play a special role in families and the lives of children, so it was a pleasure to spend time with them and share a snapshot of Junior School life at Kristin. 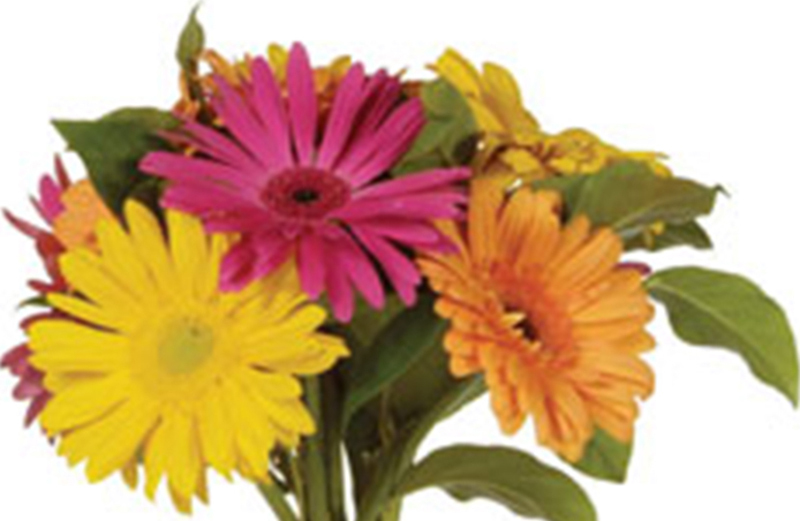 Congratulations to all students receiving bouquets this week. Described by some as 'the greatest musical of all time' and winning 10 Academy Awards as the original 1961 movie, West Side Story depicts the electrifying gang rivalry of 1950’s New York and is inspired by Shakespeare’s legendary Romeo and Juliet. Its ground-breaking choreography and unforgettable score changed the face of musical theatre forever when it burst onto the Broadway stage in 1957. 2017 marks both the 60th anniversary world-wide of this momentous production, as well as celebrating the 10th anniversary since this show first ignited the Kristin stage. Just something to 'tantalise' you for the winter. Due to popular demand, we have allocated two weekends to the Mt Ruapehu programme. Year 4-6 12-14 August and Year 7-13 26-28 August. Come along and have a fun weekend on the slopes. We cater for all skill levels and interests, whether it be skiing or snowboarding. For more information email Colleen Wassung. If your child is interested in this one day competition during the school day on May 25th, (Year 4-6) – trials will be held Wednesday May 3, 10, 17 at lunchtime in the RMGym. Please email your interest to FionaAckroyd fackroyd@kristin.school.nz if your child has not already registered. KFF are looking for a family who would be willing to host a Parent Morning Tea in Term 2 or Term 3. We hope to connect with Kristin families living in the Takapuna/Milford community and the City community. Please could you email Nicky Shave if you would like to find out more about this initiative. For those students wishing to take part in the Term 2 Snowplanet programme, registration is now open. Please get your registrations in promptly so that numbers and coaches can be organised and ready for the beginning of term. Further information is available online or email Mr Goldsworthy. Copyright © 2017 KristinSchool, All rights reserved.